Gain 2 points of reputation. 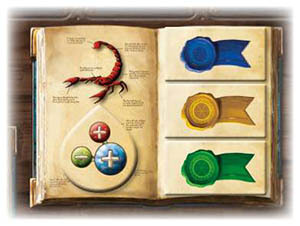 Remove the alchemical token from the theory board. Reveal each seal that was on that theory. Players who used an unstarred seal lose no points if the color behind the question mark matches the aspect that was used to debunk the theory. Players who used an unstarred seal hedging against a different color lose 5 points of reputation. 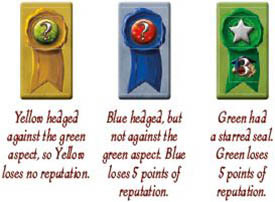 Players who used a starred seal (silver or gold) lose 5 points of reputation. All seals that were on that theory are removed from play. Seals are not reusable. (You can leave them face up near the theory board so no one has to make notes on which seals have already been used). If you have a cube on the Publish Theory action space, you have the option of immediate publication. Blue asks the card reader to reveal scorpion's blue aspect. The card reader says . This does not debunk the theory and Blue loses 1 point of reputation. Red goes next. She asks about scorpion's green aspect. The card reader says . That proves that the alchemical token is incorrect. Red gains 2 points of reputation and turns over the three seals. All three seals are removed from play for the rest of the game. You can attempt to debunk any theory, even one that you have published or endorsed yourself. If you are successful, you gain 2 points of reputation, but you will also lose 5 points if your seal does not hedge against the color you used in debunking. If this happens, count the gain and loss as one change in reputation: a 3-point loss. For example, if you had 13 points, you would count this as a 3-point loss from 13, not a 5-point loss from 15. When you prove that a specific theory is wrong, you have the option of immediately publishing a new theory, if you have any cubes on the Publish Theory action space. or a new theory involving the alchemical token from the theory you just debunked. If you have 2 actions on the Publish Theory action space, your first immediate publication uses up the first one. If you earn a second immediate publication, it uses up the second one. If you have no cubes on the Publish Theory action space, you cannot take advantage of immediate publication. Immediate publication is optional; you can wait for the Publish Theory action space if you wish and then publish or endorse any theory you want. (But don't forget that a colleague might debunk a theory and use this option to publish ahead of you). Drinking all those potions does have its consequences. You are allowed to publish theories that have been proven false. For example, if a debunking action demonstrates that scorpion contains that does not prevent anyone from publishing a theory that scorpion is the alchemical . You can even publish a theory that was debunked earlier this round. The only limitation is that you cannot use the immediate publication option to publish the exact same theory that you just debunked. That would be very poor form.